I hope everyone had a wonderful thanksgiving!!! I sure did. I'm still out of town and heading out to enjoy the last day with my in-laws. As promised - here's a design board that I've been working on for one of my girlfriends. She is looking to re-do her living room in the next couple of months. Currently she has more of a country look and wants to update her room with a more modern flair. The furniture is on order and we will be discussing paint colors and accessories in the coming weeks. The only thing I'm unsure of is the rug???? 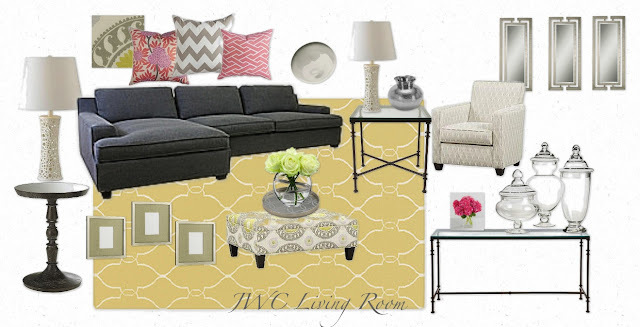 I can't decide between a cream rug or something like this yellow rug since there is some yellow in the ottoman. Right now I'm obsessed with pinks and grays. That's why I love these throw pillows with this grey sectional. Hope you enjoy!! !